We are Elisa and Rebecca, the two interns in the picture We study African Studies at the University of Leipzig. We are 23 and 22 years old and live together in Leipzig. During our studies we came up with the idea of an internship in an African country. At first it was quite difficult to find an organisation for our internship, but then we found Hope for Helpless. 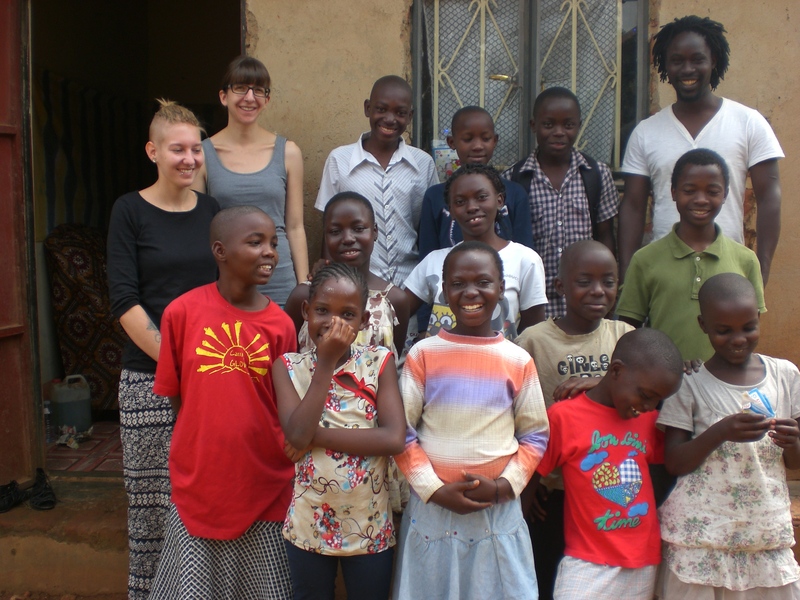 We were able to quickly and easily get in touch with Kristin in Germany and were welcomed with opened arms, the same happened in Kampala/Uganda. Kristin answered all our questions about our internship and organized for us everything concerning our stay in Uganda so that we actually just had to book a flight and pack our bags. So we had the opportunity to do an internship at Hope for Helpless in the period from October 2013 to January 2014. We payed a small fee for meals and rent and stayed together in a separate room. We were provided well with everything we needed daily. Being picked from the airport as well as being driven to the airport when we had to leave Uganda were granted. You also don’t need to worry about any stomach problems, Isaac is experienced with the european eating habits and intoduces you to the Ugandan cuisine slowly by slowly. We met the children of Hope for Helpless the day after our arrival. All of them were very happy and also very curious. Our main tasks were to take part in the computer classes and to take care of the children in the afternoons. There were no strings attached when it came to how to spend the afternoons. So you have to have a lot of motivation, initiative and fun at working independently. For example, we have changed the tree house which was already existing with the children. We have payed the costs for the renovation with donations from family and friends which we had got before our journey. Besides the work at the project there is still some free time for various excursions. Concerning those, Isaac is always willing to give you advice. Actually you can generally contact him about any questions you have. On Sundays, we recommend you to explore Kampala. The city has many beautiful spots to drink coffee, do some shop ping or simply relax for a while. And if you have had enough of the Ugandan cuisine at some point, there are plenty of European restaurants or cafés in Kampala where you can have a lovely meal. Overall, we perceived Kampala as a safe city. Of course you should have an eye on your valuables and treat strangers with caution, but shouldn’t you do just the same in Germany? So if you’re ready to live in a different environment for some time and to get to know a different mindset you will experience a lot of beautiful moments during an internship at Hope for Helpless. You will not only gain experience in dealing with children and a different environment, but also make friends and win a family. So all in all it’s definitely worth to do an internship at Hope for Helpess!